garlic | Retired? No one told me! A lovely one-pot Beef Bourguignon which would make a lovely Christmas Eve supper dish it is also really easy to double up if you are having guests just make sure you lengthen the cooking time. One of the first dishes that I cooked my husband some 40 odd years ago was Beef Bourguignon…He was a man who ate only meat and two vegetables and did not like garlic??? When he asked after saying ” That was really good” and I said Beef, garlic, red wine etc…. He now eats this dish at every opportunity and asks me to make it! 1 kg Beef…I use good braising steak. Cut into cubes. 3/4 rashers smoked bacon cut in 1/4 pieces. 250gm button mushrooms..small as I use whole. 10-15 small onions/shallots used whole. 3/4 pint good beef stock. Half bottle red wine……..I use a Shiraz. 4 large cloves garlic chopped not too fine. 2 tbsp flour for the roux. plus extra flour to coat beef. 2 tbsp Good Olive Oil. Toss the cubed beef in flour seasoned with salt and pepper. Heat some oil in large pan over med heat seal cubed beef in batches. Once all beef is sealed set to one side. In the same pan add a little drop of oil and cook bacon and garlic until bacon cooked nicely just slightly crispy. Add Beef and stir in 2 tbsp flour. Then add beef stock and stir until smooth gravy. It’s like making a roux. Add Bay leaves and Red wine bring to slow boil, reduce heat to a simmer and cook for 2 1/2 hrs until meat is tender. Depending on your cut of meat it may take a little longer. About 30 minutes before the end of cooking add button onions and 15 mins before add button mushrooms. Taste and adjust seasoning it may need more pepper. Again it is personal taste. This can be served with mashed potatoes and vegetables or rice and vegetables. If you loved this recipe please pin me! 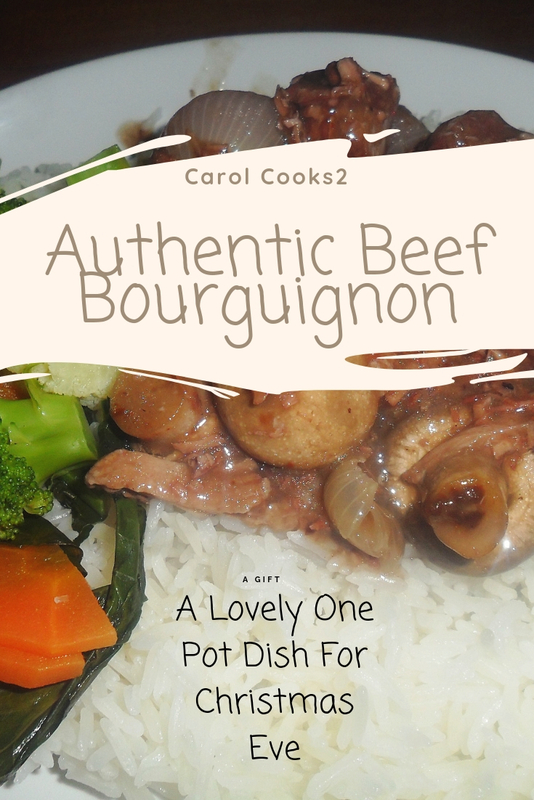 This entry was posted in Authentic recipes, Beef Bourguignon, Carol Cooks2, Cook from scratch, Uncategorized and tagged Beef Bourguignon, Button Mushrooms, Button Onions, garlic, Recipes, Red wine on December 9, 2018 by CarolCooks2. A subject which I am very passionate about is waste plastic, food and anything which fits in between…We live in a very beautiful world and it is getting trashed by mankind in the name of greed, profiteering or just plain laziness because we can’t be bothered to dispose of it correctly. Sour Dough…Why on earth can’t sneaky bakers and manufacturers leave our Sour Dough alone or make it properly? I was actually really surprised and pleased at how many people make their own sourdough bread the art is not lost and seems to be growing. This entry was posted in Christmas Beetle, Christmas Cake, Christmas Pudding, Cooking from scratch, Fried Onions, No faddy diets just healthy food, Onions, Pickled Garlic, Pickled Onions, Retired No One Told Me! 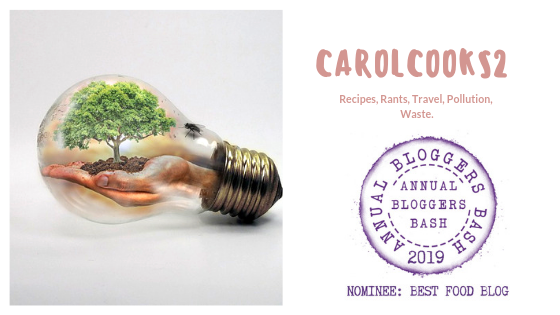 Weekly roundup!, Sally and Carol Health and recipes, Sally at Smorgasbord Health 2018, Uncategorized, Unhealthy Eating and tagged Carol Cook's, Carol Taylor, Carol's Cookery Column, Cook from scratch with Sally and Carol, garlic, Onions, Rants and Recipes, Recipes, Stanley Hotel, Weekly Roundup on November 4, 2018 by CarolCooks2. Starting to appear in the headlines across the media is news that following last year’s high death rates from the flu, and the ineffectiveness of the 2017 vaccine, a new maxi-strain format is going to be available this year. New super-charged vaccine will be made available this winter for people over 65 – who are most likely to die from virus. This entry was posted in Flu Season, Health & Nutrition at any age, Immune System, New Mega Vaccine UK, Sally at Smorgasbord Health 2018, Uncategorized and tagged Bone Soup, Boost your immune system, Eat yourself fit, Flu Season, garlic on October 5, 2018 by CarolCooks2. Today I will show you how to make a Pork Stock for this lovely soup…Thai’s make beautiful stocks either chicken( last weeks) or Pork and they are the basis for many of their dishes. Using the neck pork bones this is a very tasty stock…a basis for soups and stir-fries. 2 coriander roots ( I remove the roots from coriander when I use it and keep a small bag of them in the freezer handy for stocks or anything which calls for coriander root. Wash the pork bones and put in a pan and cover with the water bring slowly to a slow rolling boil any scum will rise to the top. Cook very slowly for an hour and them skim off any scum on top of the water. Add the aromatics and simmer for about 1 hour. Strain the stock and throw away the aromatics if the bones have any meat on them pick the bones when they have cooled down and add the meat to stir-fries or as I do give the bones to Saangchai, he loves them. If not using the stock immediately then store in a portion in zip lock bags…Don’t fill too much and then you can store it flat…easier to thaw out. The ingredients for the soup have no amounts apart from the stock and garlic the reason being that it is down to taste and the amount of soup you are making…Thai food is very much about taste and taste again. About 150 gm of minced pork. Napa Cabbage break the leaves into pieces. Glass Noodles soaked in water 10-15 mins and then cut into pieces. Firstly cook the chopped garlic in some oil until it is golden and crispy ..make sure you watch it as it very quickly goes from not quite brown enough to burnt…Once the garlic is cooked remove from the oil and set both the garlic and oil to one side as it is for the garnish. Slowly bring the pork stock to a simmer and then add the ground pork seasoned with a little soy and white pepper…form into small balls and drop into the stock. Cook for a couple of minutes and add the cabbage. Add the soaked noodles and check the seasoning… Put into individual bowls to serve and garnish with spring onions and garlic and if liked add a swirl of the garlic oil. If you missed the Chicken Noodle recipe then I have added the link here. Some of my recipes may not be in line with traditional ingredients and methods of cooking but are recipes I know and have become to love and maybe if you dare to try you will too. You will always get more than just a recipe from me as I love to research and find out what other properties the ingredients that I cook with have to improve our health and wellbeing. This entry was posted in A Taste of Thailand, Cooking from scratch, Pork Noodle Soup, Thai Pork Stock, Uncategorized and tagged Authentic Thai Food, Gaeng Jeud Woon Sen, garlic, Pork bones, Pork Noodle Soup, Recipe on September 27, 2018 by CarolCooks2. Krapow Moo is my favourite Thai dish and one which we often have for brunch..we are a two meal a day family. It can be made with Chicken mince but I prefer pork mince. For maximum heat, I always grind my chillies and garlic together in my pestle. 4 snake beans cut into 1/4 inch slices.If you can’t get the beans pictured then ordinary green beans will be fine. Krapow …A big bunch of Thai sweet basil Leaves picked and as you can see from the photo I use quite a lot. A splash of cooking oil…I use Coconut oil. Good shake of seasoning..not sure if you would get the one I use here but if not just a little pork/chicken seasoning salt. Peel garlic and cut chillies finely at this point I put in a pestle and mortar as it brings out the flavour. If you don’t eat your food very hot like us then just cut chillies and garlic finely. Add a splash of oil to a hot wok and add chillies and garlic cook stirring for 1 minute being careful the garlic doesn’t burn. Add the minced pork( chicken) and stir until cooked 3-4 mins. Add all sauces and stir cooking for 1 minute. Add a little hot water if the sauce is too strong. Then add the green beans and cook 1 min then add Grapow and stir until wilted. Serve with rice and a fried egg which is traditionally how Thais eat this dish. N.B.Holy Basil is available now in many Asian stores throughout the world. This entry was posted in A Taste of Thailand, Authentic recipes, Authentic Thai Food, Authentic Thai Recipe, Krapow Moo, Uncategorized and tagged Chillies, Essan food, garlic, Issan food, Oyster Sauce, Pork Mince, Recipe, Snake beans, Thai Food on August 25, 2018 by CarolCooks2. Healthy Eating…Ditch the Purine Rich Foods and say goodbye to your painful gout. My mother suffered from gout on occasions and took a lot of ribbing and leg pulling from my father and my sons on her consumption of alcohol and as she was tee total she used to get a little irked with them at times. It is now proved to be connected with diet and sufferers are recommended by the medical profession to avoid certain foods which are known to aggravate gout. A diet high in fat can interfere with your kidneys’ ability to rid your blood and body of uric acid therefore avoid full-fat dairy products like whole milk or regular ice cream, baked goods such as muffins or cakes that may incorporate a high amount of fat or oil and salad dressings. Do not eat fried foods or foods served with rich gravy or cream or cheese-based sauces. Aim to limit your total fat intake to no more than 30 percent of your daily calories. Some fish, seafood and shellfish, including anchovies, sardines, herring, mussels, codfish, scallops, trout and haddock. Some meats, such as bacon, turkey, veal, venison and organ meats like liver. To avoid a build up of purines which cause painful crystals to form between the joints then it is best to follow a low purine diet by cutting down on excess fat as fat can inhibit the body’s ability to process and eliminate uric acid. Drink plenty of fluids 8-12 servings of liquid as it serves to dilute uric acid but do avoid soda pops and another with high fructose levels. Tofu is also a good addition to a menu but as with all things…What do I say?? Moderation and limit servings of tofu to 2-4 servings per week. Most vegetables are low in purines, BUT several contain a moderately high concentration ranging from 50 to 150 milligrams of purines in every 100 grams of the food AND these should be limited and eaten in moderation. These vegetables include all dried beans and legumes, mushrooms, spinach, cauliflower and asparagus which is why it is best to limit your consumption of these to no more than two servings per week. A guideline is 1 cup of the vegetables raw or 1/2 cup cooked is equivalent to a serving. Food which can be freely eaten as they are low in purine are Potatoes, bread, rice, wine( moderation), fruit and juices. If losing weight is your goal then take it slow weight loss helps increase the levels of uric acid in the body. If you’re concerned about your uric acid level, eat only a moderate amount of animal-based protein daily — a maximum of 6 ounces per day with a limit of 3 ounces per meal. Meat, poultry and seafood with a high purine content of over 150 milligrams in every 100 grams should be strictly avoided. Organ meats like liver or kidneys, game meats, goose, partridge and shellfish such as mussels, scallops, anchovies, shrimp and herring fall into this category. If you are now feeling well..What can I eat then to help this painful gout…There is still much you can eat and control your gout at the same time. If you look at the foods you can eat then lovely home-made soups can be on your men just make sure that you make your own homemade stocks and don’t use concentrated stock cubes with a little thought and careful menu planning there really are many, many choices and dishes that you can make and enjoy while reducing your purine intake. I have include a couple of links with examples to get you started on your new eating plan please don’t look on it as a bore and a chore embrace it and that painful gout will soon be under control. The squash I always make into a vegetable soup and freeze in portions. When I reheat, I then add chilli (of course) and a little coconut milk and gently warm through. 1 small squash, peeled and deseeded. Cut into pieces. 3 Broccoli stalks, peeled and cubed (I always save the broccoli stalks) for when I make soup. Waste not, want not and I think ideal for soups for flavour. Heat a glug of olive oil and gently cook garlic ginger and onion to just soften and not colour. Add other vegetables gradually and cook while stirring for about 5 minutes, then add stock and seasoning. Simmer gently for about an hour or until vegetables are lovely and soft and remove from heat. I let it cool down before I blend. This makes a lovely vegetable soup but I also use it as a base and freeze in portions. When I reheat I add little-dried chilli flakes and 1 or 2 tbsp of coconut milk. It just gives it a creamy flavour. Sometimes I add crushed lemongrass stalk and a little fish sauce, it depends on how I feel, it is a versatile soup base so play with it, have fun. Add some curry powder, a squeeze or 2 of lime juice or coriander, whatever you fancy. Enjoy! Secondly I have a lovely quick, tasty pasta dish for you to rustle up. 1 chilli finely sliced…I don’t remove the seeds but if you don’t like it too hot then remove the seeds. a few torn basil leaves optional. Cook your pasta in boiling water..No salt or oil. While the pasta is cooking heat your tsp oil in pan and add the garlic cook for a minute and add the chilli and the tomato pulp. Cook stirring until heated through and add the zucchini and cook for 3-4 minutes. One the pasta is cooked, strain and toss with the zucchini mix. then sprinkle with salt and black pepper and grate some parmesan over the top scatter with torn basil leaves if using and there you have a nice tasty pasta dish. My social media links if you would like to connect with me. This entry was posted in Cooking from scratch, Gout, Healthy Eating, Low purine foods, Uncategorized and tagged Coconut milk, garlic, Gout, Low purine foods, Recipes, Squash, Zucchini on March 27, 2018 by CarolCooks2.